It's November 16th, roughly halfway through my little experiment. 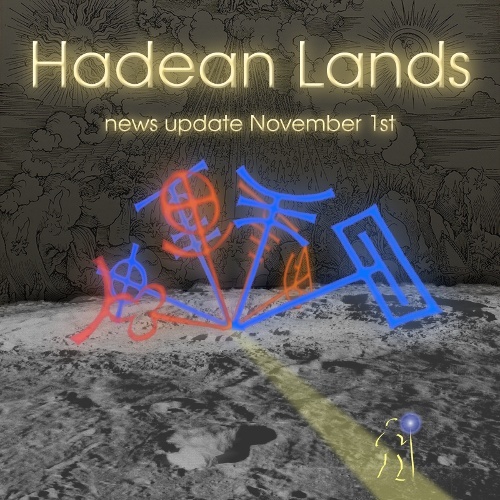 An extended game teaser for Hadean Lands. Now with a second ritual to complete! And many more objects to play with in the process! Now, just a little bit of self-congratulation: CNNMoney asked to reprint my Update #8, the post on running Kickstarter successfully. Very kind of them. Overall, you can probably guess that I'm utterly thrilled with the way things are going. Contributions are still coming in steadily, if slowly. I'm hoping that the upcoming weeks see my plans percolate out from the gaming press into business reporting, writing circles, and -- heck, I don't know -- web comics journalism. I mean, why aim low? Two weeks ago I put up a teaser image, which drew a lot of nice comments and anticipation within the IF community. (Thank you!) But one image in one blog post does not a lifestyle make, and today the real fun begins. Here's the scoop: at the end of this year, I plan to quit my job and start working on interactive fiction full time. Yes, really. The space madness has struck and it's time to do this thing. I can't do this in my spare time any more; I have too much work to finish in the IF world, and it eats at me every time I leave for my day job. Go to the Kickstarter page to watch the awesome introductory video! (A Gameshelf production, of course.) 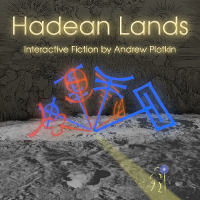 You can also play the teaser scene of Hadean Lands on my web site. Get ready for Halloween and come to play The Lurking Horror, an interactive fiction piece that brings Lovecraftian horrors to G.U.E. Tech, a fictional version of MIT. Dave Lebling, author of The Lurking Horror and Zork, also an MIT alumn, will join us as we fight the creatures of the Unspeakable. After playing, we will offer a campus tour of the different locations that are (approximately) in the game. If you have not played interactive fiction (a.k.a. text adventures) before, this is your chance to learn the basics. If you already know how to play, come and experience how fun it is to play interactive fiction with a room full of people. If you've heard the call of Cthulhu, this is the place to be. The event will also be broadcast online via ustream. Our regular monthly meetup. We will look at this year's IFComp entries, watch a surprise video, and discuss whatever else is up in the IF world. The Manhole for iPhone/iPad/etc is out. (App Store link) It's a whimsical children's story-or-environment -- worth exploring if you only know the Myst series. Riven for iPhone/iPad/etc is marked as "coming soon". Riven is my favorite of the series, but I haven't played it since its original release -- it's notably hard to get running on modern machines. 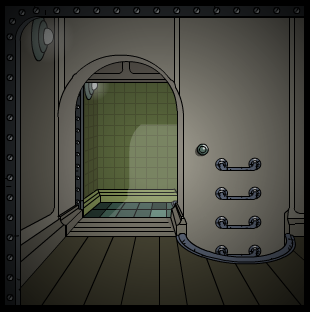 (Even harder than Myst, which has been updated and re-implemented all over the place.) I am seriously looking forward to this one. Cyan also pushed a stack of games up on Steam. But if you use Steam, you probably saw that. And finally, this teaser page was linked from Cyan's home page today (although I don't see it there now). The banner tag was "Never Let Your Timbers Be Shivered." What is it? Looks like some kind of resource-based explore-and-fight. With pirates. That's all we know -- except that a Cyan folk also dropped into a forum thread and linked to this MP3 file. This story has already guttered out, but the serious disassembly happened on Usenet where most people won't see it. So I will dedicate a few hectopixels to documenting the situation. The caps were apparently insufficient sarcasm, as this drew a flood -- okay, a small backwash -- of "Oh my god Infocom returns could it be true!" posts, on Twitter and various gaming web forums. Exciting, huh? The image name implies a game called "Triumvirate", presumably a follow-up to Trinity. Except, alpha, the web site is not new. It appears to have been registered in June of 2007, and it was last updated in July of 2007. That "coming soon" has been frozen for two and a half years now. And beta, the web site is not owned by Activision. It's registered to a guy in Germany named Oliver Klaeffling. Now, I have no beef with some IF fan deciding to write a followup to Trinity. That's fanfic, and fanfic is cool. But you shouldn't start cheering for the logo on his web site; cheer for the work. And Klaeffling does not appear to have finished the work. "But what about the trademark?" you ask. Okay, this is where the story gets -- not exactly interesting, but at least a little bit convoluted. Activision bought Infocom in 1986. That included all the games and all the trademarks. However, they stopped using the Infocom label on new releases after Return to Zork in 1993. (Zork Nemesis and Grand Inquisitor were just labelled "Activision".) They continued to reprint the old text games as "Infocom" until 2002, and then they dropped it entirely. In July of 2007, Oliver Klaeffling applied for the Infocom trademark. 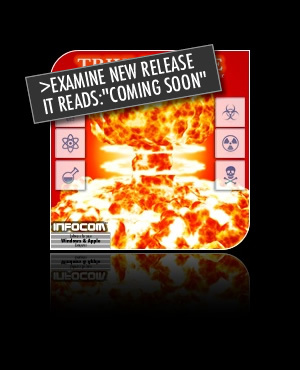 He had already registered the infocom-fiction.com domain, and he put up the image you see above. Then -- nothing. He never completed the trademark application process. The USPTO declared it "abandoned" in October 2008. At almost the same time -- October 2007 -- another Infocom trademark application went in, this one by "Omni Consumer Products LLC". This is a deliberately silly company name, but it's a real (small) company. It consists of Pete Hottelet finding fictional products (such as "Brawndo" from Idiocracy) and getting permission make them as real (licensed) products. So that's where the "Infocom" trademark is now: it's held by the maker of Brawndo. Take that as the character note of the 21st century, if you like. Hottelet does not appear to have to have done anything IF-related, but Dave Cornelson said he was emailing him about the trademark, and maybe something will come of that. Where does this leave Klaeffling? He doesn't have a trademark, and Activision still owns the copyright on Trinity. In the past, Activision people have been generous about permitting free fan-made games in the Infocom settings. But I have no idea if those people are still at Activision. I also have no idea if Klaeffling intended to release his game for free or as a commercial product. Also, of course, I have no idea how far he got implementing it. Conclusion: I have no idea. But it's safe to say the game isn't coming out this month. Footnotes: Thanks to Stuart Moore for posting facts rapidly on rec.arts.int-fiction. Also this handy trademark blog post from 2007. I know, I'm supposed to be all on top of Myst news. But I've slacked on this post, which is the post where I tell you that Myst Online is back online, totally free (but Cyan is accepting Paypal donations). Everything takes longer than expected these days. Cyan Worlds' plans are to move MO:UL to open source, and we finally have some good news. We've taken a first step and started a MO:UL server, so the Ages of Uru are available again. We've opened all the Ages, and added most of the goodies in MO:UL. We're referring to it as MO:ULagain - feel free to explore and enjoy. What with the blizzard of iPad hype, everyone is talking about "multitasking" and how it is either a crucial tool of the Matrix infoconomy or a hideous, battery-destroying distraction from Getting Crap Done. Irony shields to maximum, either way. I just read through an essay, Understanding Multi-tasking on the iPad by Milind Alvares. It is a good overview but I think it oversimplifies to hit its target ("the hell with traditional multitasking", if I may summarize Alvares in five words). Software multitasking -- can several programs be running at a time? App multitasking -- can the user do something that involves several apps? User multitasking -- can the user do several things at once? The 7th Casual Gameplay Design Competition, hosted by JayIsGames has just begun. That's thirty new short-form IF games, around the theme of "escape". All are playable online on the competition page. This is one of the first big modern-IF events to occur outside the IF community. (The extended federation of IF communities, I should say, since there are many.) This comp has clearly gotten the attention of IF regulars; I see several familiar names on the game page -- Stephen Granade, Jim Aikin, Jim Munroe, among others -- as well as many who are entirely new to me. I am keen to find out both what the new authors are writing, and how the new players react to (what I think of as) the established talents of the field. Voting is open for the next three weeks, and anyone can vote (you have to sign up). Enjoy. We also have confirmation that PAX East will be sold out and no badges will be available at the door. Preregister or stay home. (By which I mean, "preregister"!) If the cost is a problem for you, they're looking for volunteers, who will get free admission. EDIT-ADD: I forgot to mention the Purple Blurb presentation on Monday! See above. EDIT-ADD again: We are going to be hosting an open IF hospitality suite where you can come see IF people and talk and try our games and stuff. See this post! But, equally of course, genre terms have never made any sense on the literal level. "Science fiction" is broader than fiction about science; "fantasy" is more specific than made-up stories; and, closer to home, "adventure game" does not denote every game about people having adventures. No, my real beef with "point and click" is that I have no clear idea what it means. What games are point-and-clicks? I have theories. Guesses. I don't know if they match up with anybody else's theories. When someone says "point and click" I have to go look at screenshots to figure out what kind of game it really is. I never hesitate to blather about genre definitions but in this case it will be more fun to run a poll. Yes, one of those ridiculous Internet polls. Only The Gameshelf doesn't have a poll widget and I'm not energized enough to... well, to ask Jmac to install one... so I'll just post a list and you-all can comment. Comment! I know you're out there. I can hear you breathing. 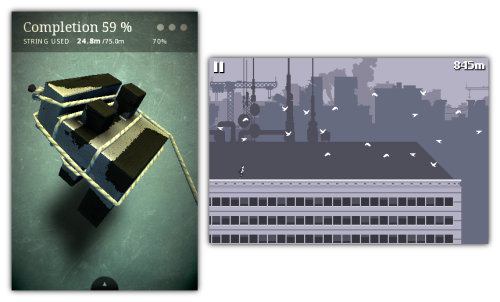 Which of the following games are "point and click"? Note that the question is not "which of these are good games?" or "which games did I enjoy?". This is pinning down the boundaries of a category. If you want to say why a given game is or is not in the category, that's cool too. An short introduction to interactive fiction (text adventures, such as Adventure and Infocom's games), the history of the form, how they are played, and a little about what's involved in writing them. With Nick Montfort, http://nickm.com Video by Talieh Rohani for the 2009 Jornada Nacional de Literatura in Passo Fundo, Brazil. Nothing you or I don't know, but good for the general audience. Plus, you can see some of Nick's hardware collection. Also: Nick's gameplay teaser video for his game Book and Volume.